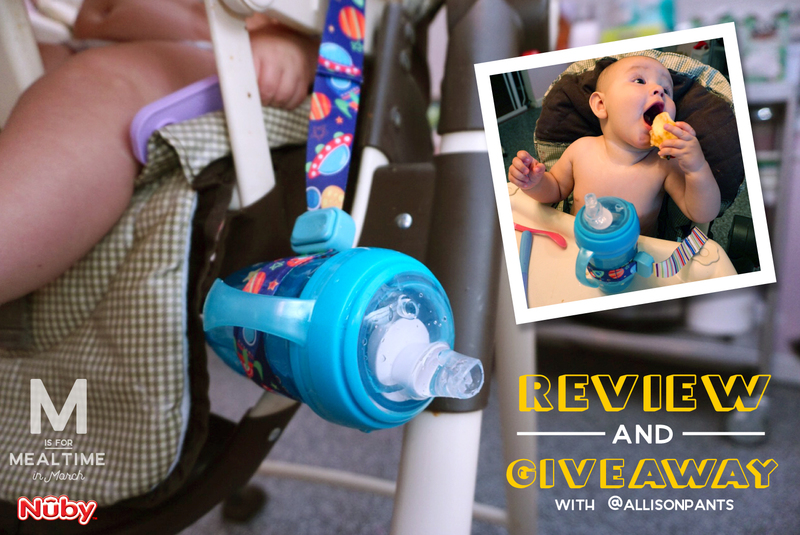 M is for Mealtime - Babies R' Us & Nuby Giveaway! Throughout March, Babies R' Us is having a sale on select Nuby mealtime products on their site! In collaboration with them, and Nuby, I am giving away BOTH a Nuby BPA Free 360 Degree Two Handle Comfort Cup (in a boy or girl color) and a Nuby BPA Free Keepeez Sipper Gripper (in a boy or girl color). Read more to find out how to enter to win! You can also purchase your own Nuby mealtime products during the Buy More, Save More Sale at Babies R' Us! Great savings on Nuby infant & toddler feeding products at Babies R’ Us stores & online. Buy 1 Get 10% off, buy 2 get 20% off, buy 3 or more and get 30% off! The sale includes bottles, cups, mealtime, bottle accessories, & bottle dish soap. It runs from 3/2-3/26 and you can view the details of the promotion here. In our house, dinner time is both my favorite time and the most hectic time. It's hard to find ways to keep the kids entertained, and find time to prep and cook dinner. But as you know, we like to incorporate them helping into our dinner time routine, as much as possible, and this fosters Lemon's love of cooking (and hopefully Indy's one day!). So, even though Lemon wasn't into making spaghetti, she got up on her kitchen stand and helped! They took baths outside and then we snuggled a bit because the hose water is still a bit too cold, even in 93 degrees! When making dinner, if Ian is running errands, I usually wear Indy so that he feels like he's still snuggled and supported, while we are focusing on meal prep. Then, if he gets bored (or isn't tired) we put him in his high chair so he can still be part of the action. We usually give him a snack (tonight it was the core of an apple) so that he is entertained while we finish dinner. 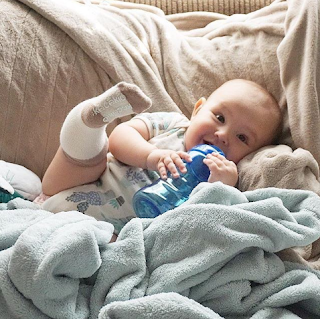 The 360 cup is so cool for babies learning how to drink from cups! You don't have to tip it in order for them to get water. It has a part inside that brings the water up, like a really flexible straw, from no matter where they are holding it! It can be flat on a surface and they'll still get water. It is our FAVORITE cup! This cup strap is AWESOME. Babies (especially this boy) love to throw their stuff off of their high chair, this Nuby strap keeps it still attached so he can easily pull it back up to take a drink! Success! Tonight she wanted spaghetti with meat but no sauce, cheese and butter. Easy! The purple water bottle pictured is Nuby's New Thirsty Kids Flip it Water Canteen. We LOVE it, perfect for your active toddler and Indy can drink out of it too! It is BPA free, no spill, and has an easy press button for opening. A great addition to your cup collection and perfect for attaching to backpacks and taking on adventures! Best Toys for 1 Year Olds - Diapers.com Gift Card Giveaway! I am exploring the best toys for 1 year olds, for Indy's birthday coming in May. I have found a couple of articles with toy suggestions, like this one from My Kid Needs That and this one from Parents Magazine. His interests are so different from Lemon's, and he is so bored with all of her baby toys that we saved for him, ha! Indy's favorite is still playing with tags, or anything that has hanging parts/pieces. He explores everything with his little index finger sticking out, it's the cutest thing! We also just bought him his first "car," a musical fire truck, it's so cute how much he loves it. He also just learned to army crawl, really fast, so he likes to get into everything; something Lemon never did. I watched him touch a plug about 10 times the other day, he knocked over the dog's water dish (all over himself) and got stuck in the crack of the bed (awake) while just playing around. Boys! I feel like I need to start bolting everything to the wall, just in case. Ugh. This Squeeze n' Squeak lion, upper left, can be found here. Anything with parts is fun for him, not for me to clean up! 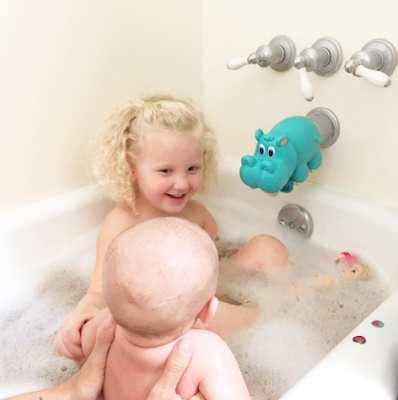 Toys for teething are great for a 1 year old, and the Nuby Nana Nubs is one of Indy's favorites! (Nuby also makes a similar product that is available here.) Anything with bristles to use as a gum massager is perfect for him, he'll drool and chew on it for hours. This yellow toy submarine is available here. Spoons and cups are always a hit with babies. I sometimes wonder why we even buy toys at all! Along with remotes, water bottles and keys you kind of already have it all when it comes to "toys!" Ha! This kid LOVES water, and cups. Comment below with YOUR child's favorite toy, and their age, for a chance to win a $50 gift card to Diapers.com! Your comment will count as your entry for this giveaway. For additional entries, view my Rafflecopter below! This giveaway is a partnership with Nakturnal, with a prize of a gift card to Diapers.com.